Ellie was dealing with serious lameness and non weight bearing in her one hind leg. 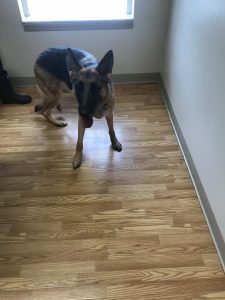 She was no stranger to limping as she is a two year old shepherd that LOVES to rough house with her 3 year old shepherd brother. The two are crazy and often times will come up with some sort of lameness. Something was different about this limp though, she wasn’t getting any better, in fact her limp appeared to be regressing. At that point, her parents decided to try chiropractic. Ellie’s first visit was very typical of a pup with a cruciate tear. Her muscle tone had huge differences side to side, in fact it was inches of difference. She was very tender at her knee joint and had some mild gapping. Aside from all of this, she truly didn’t let it change her personality. Ellie was adjusted once a week for three weeks, and in that time period the change was astonishing. She went from non weight bearing to toe tapping, to fully weight bearing in three weeks. Her playfulness returned and her muscle tone was well on its way to recovery. Ellie is one of many dogs dealing with knee injuries. These are tricky injuries as they aren’t often given many options as far as healing and prognosis. 9 times out of 10, surgery is recommended. Medications such as NSAIDs, steroids, and muscle relaxers are often times recommended. For those that want to try another option before going that route, chiropractic can be a great option, just look at Ellie! Knee injuries are rarely a time sensitive injury, which means there is no harm in trying an alternative route first! What Dog Breeds Are Predisposed to Back Problems? Fleas, Fleas, and more FLEAS!